Why else would I crave this? I don’t even like bananas all that much. Preheat the oven to 350˚F. Divide the banana slices among 6 crème brûlée dishes, arranging them in a single layer. Combine the cream, cinnamon, nutmeg, and salt in a small saucepan and heat to a simmer. Whisk together the yolks, sugar, and brown sugar in a medium bowl. Continue whisking while adding the hot cream in a thin stream. Strain through a fine mesh sieve. Stir in the vanilla, if desired, and skim off any foam from the surface. 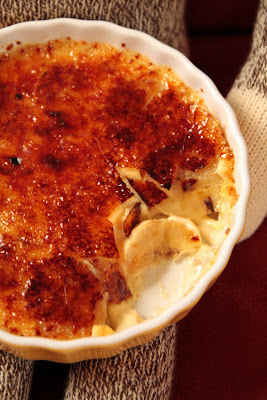 Divide the mixture among the crème brûlée dishes and place them into a roasting pan. Add enough hot water to the roasting pan to come half way up the sides of the crème brûlée dishes and bake for 22 to 24 minutes, or until just set. Remove from the water bath and let cool to room temperature. Refrigerate for 3 to 4 hours, or until firm. Top 1 crème brûlée with 2 teaspoons of the Turbinado sugar and swirl to coat. Caramelize the sugar with a culinary torch. Finish the remaining crème brûlées with the remaining Turbinado sugar in the same manner. Serve immediately. Serves 6. There’s just a hint of spice in these brûlées. Double the amount of cinnamon and nutmeg if you like more. You can tell that the crème brûlées are done when they jiggle like gelatin. If you don’t have crème brûlée dishes, you can use ramekins, but they will take slightly longer to bake. And if you don’t have a culinary torch, you can caramelize the sugar topping under a preheated broiler. Crème brûlées may be baked a day or two in advance and kept covered with plastic wrap in the refrigerator. Add Turbinado sugar and caramelize just before serving. I love the Sock Monkey picture, but I would expect the dish to be empty! 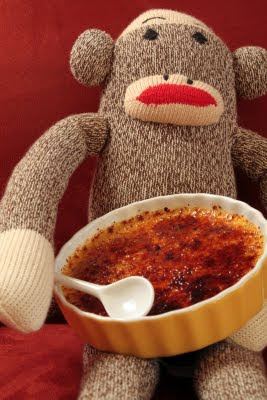 How did you keep the monkey from eating the brûlée? He was just getting started on his second one.